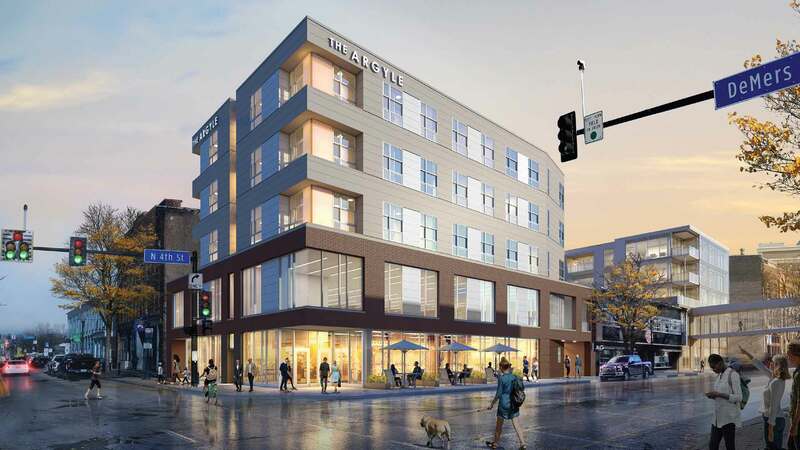 The Argyle brings life and vitality to Downtown Grand Forks through the reinvigoration of a vacant lot on a prominent corner. Designed to promote walkability and downtown vibrancy, The Argyle includes street-level commercial space, second floor office space, and three floors of residential space. The location creates a strong brand presence for the first- and second-floor tenants and provides a fresh working environment overlooking the Red River. Modern architecture utilizes a combination of traditional building materials to respect the historic nature of the downtown business district, with the transparency and lighting effects of an exciting contemporary look. The modern design utilizes a combination of modern and traditional building materials to be respectful of the historic nature of the downtown business district.